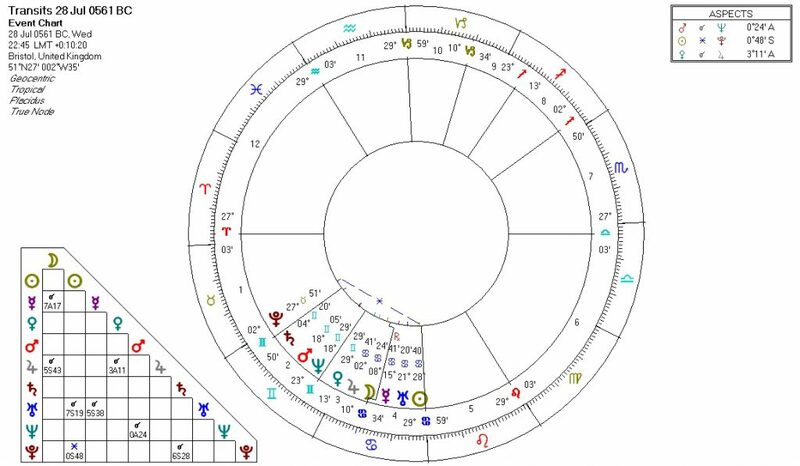 Something I have always wondered since encountering astrology is if there was ever a time at which all the planets were aligned. Prior knowledge of astrology and human history tells us where to look. 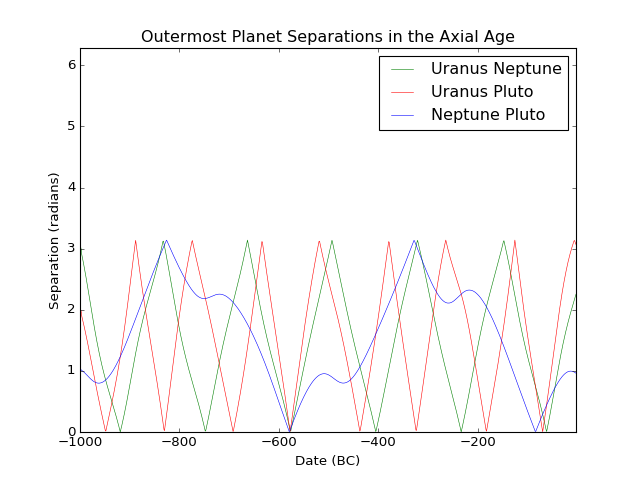 One of the most remarkable facts about the universe, to my mind, is the triple conjuction of the three outer planets Uranus, Neptune and Jupiter during the axial age. The axial age was an immensely significant period in human history. Occurring over the centuries of the mid First Millennium BCE, it was the period that saw the the development of writing and money themselves; the many artistic and scientific achievements of Greek culture, with the Socratic philosophers occurring towards its end; the Hebrew prophets and the formation of the Judaic religion; in China Lao Tzu and Confucius; and in India the period of the Upanishads and the advent of Buddhism. The similar quality of these developments has been extensively noted. No one simple idea captures the parallel nature of the developments, but in all cases a new understanding of the human relation to the divine can be discerned, beyond the archaic understanding in which this relation was mediated by the King (sometimes in ways that interestingly prefigure the Trinity). For a superb, scholarly discussion of the this period, I highly recommend Robert Bellah’s Religion in Human Evolution. The full planetary alignment of this year is referred to on Wikipedia. Perhaps more than anything, a result like this conveys the vastness of history. However troubling our present moment is, we are in something bigger, and a perspective of a deep past and deep future is both vitally important and deeply nourishing.